This paper explores the archetypal symbolism in the final chapter of Michael Maier’s (1617) seminal work Symbols of the Golden Table of the Twelve Nations, which Maier treats as a dessert to the main course, a recapitulation of the foregoing work. The chapter is entitled “A Subtle Allegory” (i.e., Allegoria Bella) and describes the journey of a pilgrim, presumably Maier himself, who embarks on a quest in search of the mystical phoenix. Maier called this quest a “peregrination” (para. 1). That Jung viewed the peregrination as “an odyssey in search of wholeness” (1944/1952, CW12, p. 191, Fig. 97) suggests that he put it on par with his principle of individuation, the personality’s tendency to move toward wholeness and self-realization. Jung further suggested that Maier’s phoenix symbolizes the archetype of the self, the center and totality of the psyche, and the origin and goal of the individuation process. Thus, this paper contends that Maier’s “A Subtle Allegory” prefigures a number of Jungian ideas that include the ideas of the self and individuation. Beyond Jung’s (1944/1952) initial investigation and some supplementary commentary by Edward Edinger (1995), psychological study of “A Subtle Allegory” is scant and I think it deserves further inquiry. Outlining the basic premise of Maier’s (1617) allegorical work, I explore the similarities between Jung’s individuation process and Maier’s peregrination, drawing parallels between the archetype of the self in analytical psychology and the phoenix symbol in Western alchemy. Because “A Subtle Allegory” is lengthy and replete with a plethora of religious and philosophical symbols, a single paper would not suffice to adequately exhaust its full scope. Thus, I have limited myself to the core ideas that parallel the basic postulates of Jungian psychology, providing a brief sketch of what I consider the central themes of the allegory punctuated by my commentary and suppositions. Before proceeding, the reader could benefit from a few introductory remarks on Symbols of the Golden Table of the Twelve Nations (Maier, 1617). Maier’s book consists of over 600 pages of rich mythological, historical, and alchemical allusions. Thus, any extensive survey of the entire work is beyond the scope of this comparative study. Rather, this paper focuses on developing a better understanding of “A Subtle Allegory” in regards to its depth psychological significance. Jung’s (1956/1963) Mysterium Coniunctionis, Tilton’s (2003) The Quest for the Phoenix, and an electronic version of “A Subtle Allegory” serve as the three primary sources used while researching this paper. Lastly, due to the citing of multiple sources, the names Mercurius, Mercury, and Hermes all appear in this paper. They are intended to describe the same mythologem commonly portrayed in Greek, Roman, and the alchemical tradition, and therefore are used interchangeably. In the foregoing passages, Jung (2009) seems to have employed the phoenix as a metaphor to describe what he was experiencing psychologically—a rebirth or transformation—during his confrontation with the unconscious or what he frequently referred to as the spirit of the depths in Liber Novus. Furthermore, given Jung’s (1956/1963) apparent affinity for the phoenix it is not surprising that in Mysterium Coniunctionis he dedicated twenty-four pages of in-depth analysis to Maier’s “A Subtle Allegory” in which the phoenix symbol plays a prominent role. 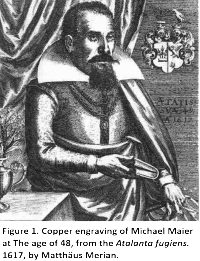 Count Michael Maier (1568-1622) (figure 1) was an alchemist, physician, and counselor to Emperor Rudolf II (1552-1612). According to J. B. Craven (2003), Maier’s association with Rudolf II directly contributed to his fame and his prolific outpouring of works. Maier also spent time in England where he counseled King James I and befriended the famous alchemist Robert Fludd. Both Fludd and Maier were affiliated with the Order of the Rosy Cross, a secret society also known as the Rosicrucians. Jung suggested that Maier was one of the founders of the group (Jung, 1961/1989, p. 232; 1956/1963, CW14, para. 312). That Maier’s ideas helped shape the dominant zeitgeist of the 17th century is an understatement, for his ideas and literary works influenced even such seminal figures as Isaac Newton. Betty Dobbs even suggested that Maier inspired Newton “to dabble with his ‘chemical’ interpretation of myth and hieroglyph and study the older texts of the alchemical canon” (Dobbs as cited in Tilton, 2003, p. 7). Maier dedicated his life to the pursuit of alchemical knowledge and thus it should come as no surprise that his works were riddled with religious and mythological allusions. His work and ideas figured prominently into Jung’s hermeneutic understanding of alchemy. There seems to be a serendipitous kinship between the two men spanning across three centuries of time. In fact, another Dr. Carl Jung, presumably one of Jung’s ancestors, was a 17th century contemporary of Maier in Mainz, Germany. However, nothing else is known about the man (Jung, 1961/1989, p. 233). With the goal of a attaining a single Phoenix feather, Maier, a pilgrim in his story, sets out on a horizontal journey across the four continents, Europe, America, Asia, and finally Africa (Maier, 1617). Maier viewed the phoenix feather as a universal panacea, which he considered a “remedy for anger and sorrow” (para. 1). He associated each continent with one of the four Platonic elements: earth, water, air, and fire. Each continent could be viewed psychologically as a function of consciousness: Europe (sensation), America (feeling), Asia (thinking), and Africa (intuition). Jung (1956/1963) felt Africa corresponded to Maier’s inferior function (CW14, para. 288), which would place it the farthest from his ego-consciousness (figure 2), a topic that I will later revisit. During Maier’s journey he hears rumors that the phoenix may be found near the Erythraean Sibyl, who Jung (1956/1963) viewed as an anima figure (CW14, para. 287). After completing his travels in Europe, America, and Asia, Maier arrives at a crossroads marked by a statue of Mercurius with a silver body and a golden head. As Maier suggests, Mercurius’s hand points the way to paradise. It is only at this juncture, when he begins to go south, that his journey assumes a certain surreal quality. This correlates to Jung’s (1942/1966) observation that the inferior function often has a numinous aspect and is associated with the personality’s inner soul image or anima. Similarly, Maier (1617) believed that the legend of this creature referred to the phoenix, which was said to have originated in that region of the world. Jung (1956/1963) viewed the Ortus as an analogue of the tetramorph mentioned in the book of Ezekiel, which as a hybrid creature combines features of the four fixed signs of the zodiac, and thus their corresponding element: Taurus (Ox/earth), Leo (Lion/fire), Scorpio (Eagle/water), and Aquarius (Angel/air) (CW14, para. 285). One could say that the tetramorph is a uniting symbol par excellence that combines the four platonic elements into an amalgamated whole. Thus it seems that the phoenix, Ortus, and tetramorph all symbolize in varying degrees the Anthropos, the original man. When viewed psychologically these images point toward an individuated personality that has integrated the four psychological functions, no doubt a Herculean labor also symbolized by Christ on the four-points of the cross. In this way, the phoenix’ death and rebirth seem to aptly symbolize Christ’s death and subsequent return to world, albeit in a transfigured body. To emphasize this point Jung turned to St. Ambrose who declared “Let this bird teach us by his example to believe in the resurrection” (as cited in Jung, 1956/1963, CW14, p. 215). Elsewhere, Jung wrote “In order to understand the phoenix myth it is important to know that in Christian hermeneutics the phoenix is made an allegory of Christ, which amounts to a reinterpretation of the myth” (1956/1963, CW14, para. 474). Jung (1956/1963) thought that the African leg of Maier’s journey represented the alchemist’s arrival at the gateway to his inferior function, which as previously discussed seem to correspond to Maier’s intuitive faculties. Maier eventually encounters the Erythraean Sibyl, who suggests that he consult Mercurius regarding the whereabouts of the phoenix. She also provides the following instructions to Maier: “This Mercury you may expect to find somewhere near the seven mouths of the Nile; for he has no fixed habitation, but is to be found now in one of these mouths, and now in another” (Maier, 1617, “Africa: Fire,” para. 1). In this way, Maier identifies the Erythraean Sybil with the same oracle that foretold the coming of Christ (Jung, CW14, para. 277). In addition to the obvious Christian allusions, the passages from both Maier and Jung suggest that there is something active in the unconscious that like a living rhizome stirs beneath the earth waiting to carry out its purpose. Jung noted, “As the ‘Tabula smaragdina’ shows, the purpose of the ascent and descent is to unite the powers of Above and Below” (1956/1963, CW14, para. 288). Jung referred to this vertical process—ascending and descending— as a “transcension” or transitus and although he did not explicitly explain what it is, he suggests that its chief operative factor is none other than Mercurius (para. 288). Maier (1617) equated the seven mouths of the Nile to the seven planets known to the ancient world, which included the Sun and the Moon. Jung added that “The experience of the fourth quarter, the region of fire (i.e., the inferior function) is described by Maier as an ascent and descent through the seven planetary spheres” (1956/1963, CW14, para. 288). Read psychologically the planetary spheres could be viewed as archetypal nodes within the personality; as such the seven planets represent different archetypal qualities of the personality. This picture accords with Jung’s view: “The ascent through the planetary spheres meant something like a shedding of the characterological qualities indicated by the horoscope” (para. 308). Mercury stands out as an anomaly from the other gods in that he has “no fixed habitation” but can move freely throughout all of the spheres, or as Jung articulated: “Mercurius is the spiritus vegetativus, a living spirit, whose nature it is to run through all the houses of the planets, i.e., the entire Zodiac” (1956/1963, CW14, para. 298). As Maier transits these planetary spheres, his personality ostensibly undergoes a transformation that is tantamount to an encounter with the gods within. Having opined that Maier’s “exciting adventure has left us a psychological document which is a perfect example of the course and the symbolism of the individuation process” (1956/1963, CW14, para. 297), Jung apparently believed that Maier was allegorizing his own journey toward wholeness and self-realization. Ultimately, Maier’s peregrination seems to depict, in his search for the phoenix feather, a circumambulation of the self in superlative allegorical form. While retracing his steps, Maier eventually finds Mercurius “where the people had at first appeared to know nothing about him” (1617, “Africa; Fire,” para. 2). Maier does not specify at which mouth he located Mercururis, however, Tilton (2003) suggested that it is the Tanitic mouth, corresponding to the planet Mercury (p. 230). Mercurius welcomes Maier and imparts to him certain esoteric secrets. This hermetic knowledge is accompanied by Mercurius’s disclosure of the location of the Phoenix. Maier’s apparent initiation into the arcana is an important supposition, which Jung aptly discerned: “Hermes hands over his art and wisdom to his pupil Maier and thus equips him to do something himself and to work with the aid of the magic caduceus” (1956/1963, CW14, para. 305). The allegory takes on an anticlimactic turn when Maier learns that the Phoenix is away for 2 weeks on another errand. Maier resolves to return home to Europe with the intention of someday returning to Egypt to discover the panacea—the remedy against anger and sorrow. The phoenix then, like the tetramorph mentioned earlier, could be viewed as an uniting symbol that can reconcile the opposites and create a sort of gnosis. Interestingly, Maier (1617) places the phoenix as the object of his journey rather than Mercurius, who fulfils his role as a psychopomp and revelator. Mercurius, as in the mythic tradition, acts as a guide to the alchemist on his peregrination. Thus, one could say that Mercurius constitutes the means of the peregrination whereas the phoenix intimates its telos. There is a peculiar illustration in Jung’s(1944/1952) Psychology and Alchemy that throws light on the symbolic relationship between Mercuruis and the phoenix. 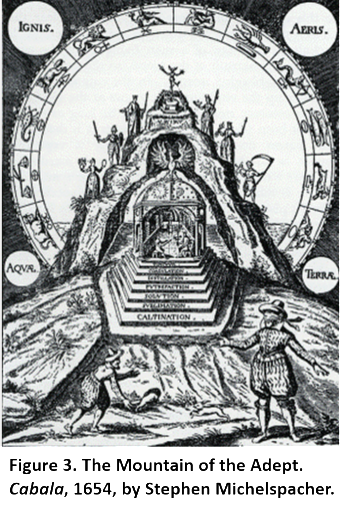 The illustration is titled “The Mountain of the Adepts” (Figure 3) and depicts a statue of Mercurius at the apex of a mountain; the phoenix is buried within the mountain where Mercurius stands. The illustration indicates that the phoenix is buried—hidden—within material reality and is the goal of the alchemical opus. Interestingly, the phoenix is shown perched atop the sun and the moon which suggests that it is produced through the Sol-Luna coniunctio, a union of opposites. In another illustration from Psychology and Alchemy (Figure 4), the phoenix image is elevated to the top of the alchemical sphere. Jung commented that “The Phoenix on the sphere, cremating itself . . . is the sign of the multiplication and increase” (1944/1952, CW12, para. 400). Jung seemed to be suggesting that the real alchemical work takes place within the human personality, which supports the basic premise of Maier’s allegory. Throughout this paper I have sought to shed light on the similarities between a few of Jung’s key ideas and some of the major alchemical themes that are present in “A Subtle Allegory” (Maier, 1617). I also suggested that Maier’s peregrination through the four continents of the world could be viewed as a spatial metaphor of his personal psychology. In this way, one could view the four continents as figurative approximations of sensation, feeling, thinking, and intuition. Together, they not only comprise a quaternity but a three dimensional mandala projected onto surface of the globe. When I first set out to research the symbol of the phoenix there was no way I could have anticipated to what degree it would influence my own personal individuation journey. In January 2014 I received a phone call from the State Partnership Program of the California Military Department, to ask whether I was interested in traveling to Africa to provide instruction to the Nigerian Navy. As an active drilling member of the California Army National Guard, I enthusiastically agreed to participate in the mission. The trip to Nigeria would include key leader engagements and even my own class on Jungian typology. Before I left, terrorism in Nigeria reached a dangerous flashpoint when on April 15, 2014, Boko Haram, an Islamic terrorist group, kidnapped over 200 school girls, whose whereabouts, as of the time I am writing this paper, are still unknown. Given these developments, I was curious whether the trip would mean anything beyond mundane matters of military affairs and international diplomacy. Interestingly, the word Nigeria is derived from the Latin root for black, niger. Viewed through the lens of alchemy, one could associate Nigeria with the nigredo. Jung (1956/1963) pointed out that “The nigredo corresponds to the darkness of the unconscious, which contains in the first place the inferior personality, the shadow” (CW14, para 646). I thought this peculiar since shadow figures in my dreams frequently appear as pitch-black native Africans, perhaps merely as a means for my psyche to effectively contrast my persona and shadow. The mission proceeded as planned and without incident in May 2014. 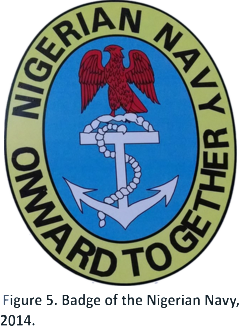 However, on the final day of instruction, I looked up at the wall behind me and for the first time noticed the Nigerian Navy’s emblem (figure 5). 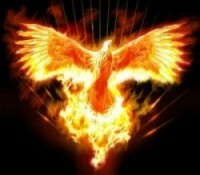 It is a picture of a phoenix. I was astonished by this meaningful coincidence, which in Jungian terms seemed synchronistic. 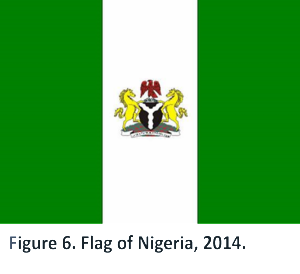 After further research I discovered that the Nigerian national symbol is in fact a phoenix, as shown here on the Nigeria flag (figure 6). Jung hypothesized that “the archetypes possess the quality of ‘transgressiveness’; they can sometimes manifest themselves in such a way that they seem to belong as much to society as to the individual; they are therefore numinous and contagious in their effects” (1954/1968, CW8, para. 660). I view the multiple occurrences wherein I stumbled upon the phoenix motif between January and May of 2014 as demonstrative of this phenomenon. These chance groupings of the phoenix motif, which culminated during my visit to Nigeria, seemed run parallel to my psychic state and my active pursuit of the idea of the phoenix. Jung (1952) described a similar experience he had while researching the fish motif for his work Aion. He counted no fewer than six chance encounters with fish-related themes during one 24-hour period (CW8, para. 827). Viewed in this light, one could say that the synchronicity in Africa was predicated on my research of the phoenix symbol which suggests the constellation of an archetype in a way that psyche and physis are situated in what the Chinese call Tao. That the archetype has both a psychic and physical aspect, or what Jung termed psychoid, suggests that consciousness serves a special role in the world. For experience has shown that the conscious observer is not an isolated spectator taking in the sights within the limited boundaries of ego-consciousness, but rather an active participant who unwittingly collaborates with the world at large. Consciousness seems to matter as much as matter does, in fact, the former and the latter could very well originate from same thing, or what Jung called the unus mundus (1956/1963, CW14, para. 622). In this way, the implications of the synchronicity hypothesis seem to stress a new ethic of individual responsibility and one could therefore say that we all are pilgrims on a peregrination that moves us toward the figurative phoenix which parallels Jung’s idea of an archetype of wholeness, the self. Craven, J. B. (2003). Count Michael Maier: His life and writings. Berwick, ME: Nicolas-Hays. Edinger, E. (1995). The mysterium lectures: A journey through C. G. Jung’s Mysterium Coniunctionis. Toronto, Canada: Inner City Books. Jung, C.G. (2009). The red book: Liber novus (S. Shamdasani, Ed.) (Philemon Series, Reader’s ed.). New York, NY: W. W. Norton. of Count Michael Maier (1569-1622). New York, NY: Walter de Gruyter. Thank you for commenting. We will aspire to provide additional interesting blog articles for everyone. Take care.